Camp nou! Més que un club! Lionel Messi, Suarez, Pique! One of the best football clubs in the world. You have the chance to see blaugrana in action. Don´t miss out the opportunity! You don´t have to handle the complex booking process! Don´t trust the sellers outside the stadium. Make your booking online so you can be sure to visit the match! You are sure to have seats when you visit FC Barcelona! Great and affordable seats behind the goals which are located in Tribune North (Gol 1,2,3) or Lateral section 1,2,3. You can benefit the following advantages: don´t have to print your tickets (show them on your mobile), you never pay tickets with absurd prices, you sit together in the same section. 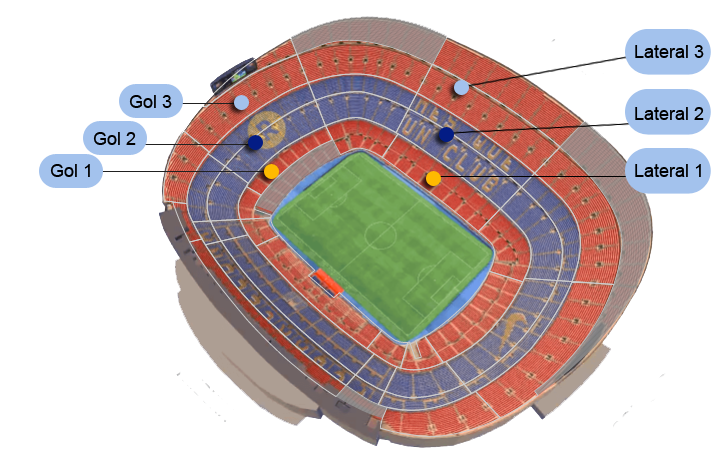 We can ensure seats as shown in the image (if the reservation is for two people) If it is for more than two we can not ensure these positions, but they will be as close as possible, always subject to the availability of the moment.FC Barcelona matches are often sold out and this is your only way to enter. We are specialised in getting you last-minute tickets. Check our website and even when the game is in most cases sold out you can book your tickets with us! You will get the tickets for the game in the sector you have chosen in one of the sections in Gol Nord or Lateral. The selection of the seats in the sector you have chosen will be done by us. There is no possibility to influence this. But the view is always the great from the section you have chosen. The seats are behind the goal on the North side or on the East Side of the stadium. The tickets include a discount code of 10% to buy your tickets for the Camp Nou Experience (which is also valid for the Sagrada Familia, Hop on Hop off Bus, Casa Batllo, Casa Mila and much more products). We try to give you tickets at a central position in the sections. We can´t give you the exact seat numbers before your pick-up but we guarantee great seats! It is not possible to switch or change seat numbers that are reserved in your name. You can not ask for cancellations under any circumstances. Same as in the FC Barcelona, we ensure seats together or very close for two people (can be in pairs, with a seat in the middle, diagonal ...). If the reservation is for more than two people, we can not guarantee that they are going to be together but as close to each together as possible, but always depending on availability. To make a group booking (more than 6 people) please contact us by email info@ticketbar.eu. This is to check the availability of seats next to each other. Sometimes the Spanish Football Association changes the date of the match to a day later or before. We can´t be held responsible for changes in your airplane tickets or hotel reservations. If a match is postponed (due to bad weather etc. ), the tickets will still be valid for the new date. We always recommend you purchase travel insurance in case you require a date change/ cancellation of your flight and/or hotel reservations.